Birmingham’s B.L. Harbert International, a construction company that builds U.S. embassies around the world, is breaking ground on a new campus for its International Division. The first phase of the twelve-acre campus, at the corner of Lakeshore Crossings, will house two new buildings: a two story 38,000 square foot office building and a 38,000 square foot logistics and quality control facility. The campus is divided in half by the Little Shades Creek. 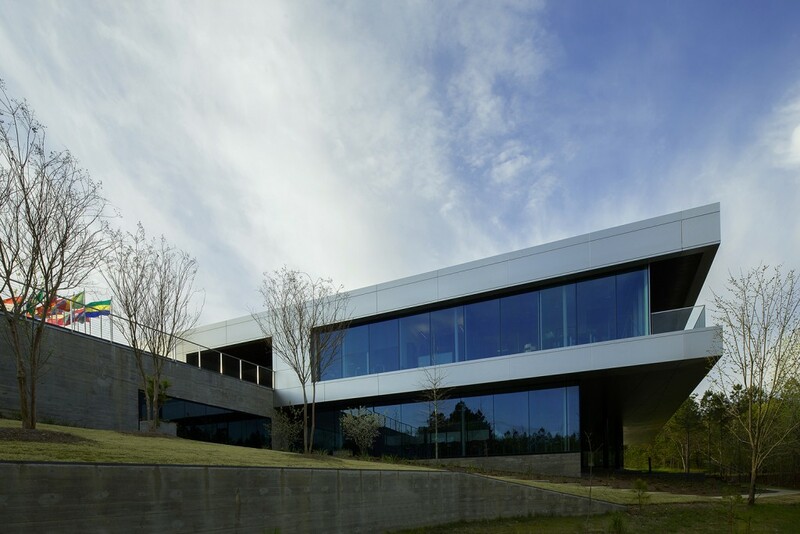 On the east half sits a unique two-story stainless steel office building detailed to highlight the builder’s craft while providing a highly flexible internal space to accommodate the company’s dynamic operations. The upper floor houses the daily operations and the lower floor, which opens to the landscape and overlooks the creek, provides a large meeting space and outdoor space to accommodate company-wide functions. On the west side of the creek is a simple tilt-up concrete building used to house the complex logistical operations required to assemble and containerize all the materials used in the overseas operations. The buildings function as a working unit and are connected by a footbridge spanning the creek. The project is scheduled to open in mid 2012.